The Use of Thermal Techniques for Seal Failure Analysis - System Seals Inc. Various techniques exist to analyze seal failure or elastomer incompatibility in hydraulic applications. Historical tests rely on basic mechanical testing and visual analysis. 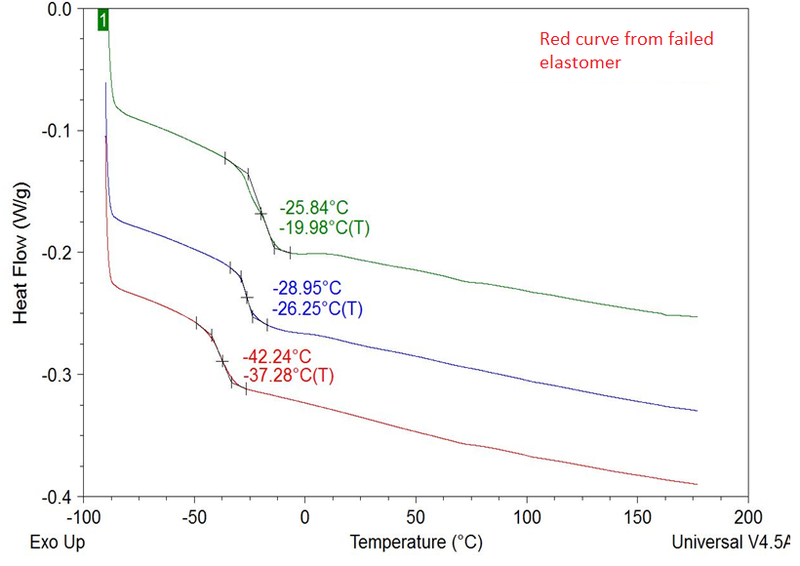 However, advanced methods, such as DMA (dynamic mechanical analysis) and DSC (differential scanning calorimetry) can illustrate failures at the chemical level. In the example below, we see an elastomer prone to tear failures. The DSC scan (red line) indicates that this failure was due to chemical changes in the material. Specifically, the Tg shifted from a base range of -25°C to -29°C down to -42°C. This indicates that the elastomer has undergone chemical changes, suggesting the failure mode was chemical, not purely mechanical. 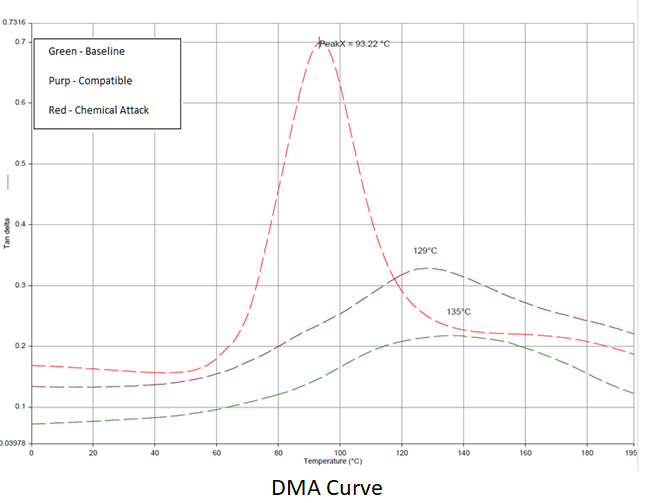 Additionally, we can use DMA to investigate changes in both Tg and mechanical performance of elastomers and composites. The DMA graph above shows the red peak of a selected composite is significantly different than the baseline. However, in this case, the red line represents a failed material, whereas the purple and green lines represent an intact material. The DMA was used to identify the failure as non-System Seals’ material, just like fingerprints are used in forensics! Thus, by using advanced thermal techniques, System Seals can identify failure modes, like chemical attack or incorrect material selection, for various materials, including elastomers, plastics, and thermosets.